Pontoons Four(4) pontoons, 34 in.x 34 in.x 144 in. 10 Ga steel 10 ga. bottom, internal bulkheads and stiffeners epoxy coated inside and outside. Working Capacity Cut 96 in. wide x 22 in. Pump Fixed Displacement Hydraulic vane pump. Capacity 100 gpm @ 2,000 psig Reservoir 24 liters 65 gallons Filtration 100% return flow through a 10 micron filter and 5% of flow through a secondary 1 micron filter with water removal capability. Others Controls: Stick controls are provided in a heated, air conditioned cab. 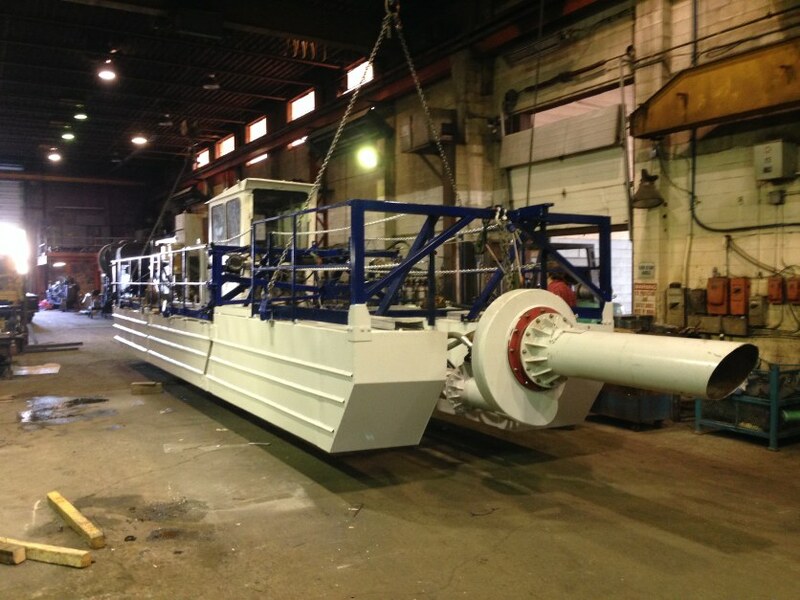 RWI 10″ Dredge in 30′ dredging configuration.